Ultrasonic Methods in Solid State Physics is devoted to studies of energy loss and velocity of ultrasonic waves which have a bearing on present-day problems in solid-state physics. The discussion is particularly concerned with the type of investigation that can be carried out in the megacycle range of frequencies from a few megacycles to kilomegacycles; it deals almost entirely with short-duration pulse methods rather than with standing-wave methods. The book opens with a chapter on a classical treatment of wave propagation in solids. This is followed by separate chapters on methods and techniques of ultrasonic pulse echo measurements, and the physics of ultrasonically measurable properties of solids. 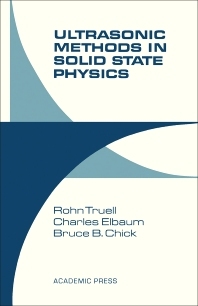 It is hoped that this book will provide the reader with the special background necessary to read critically the many research papers and special articles concerned with the use of ultrasonic methods in solid state physics. The book is intended to help the person beginning work in this field. At the same time, it will also be useful to those actively involved in such work. An attempt has been made to provide a fairly general and unified treatment suitable for graduate students and others without extensive experience.